Notes: The cemetery serves the Jewish communities of Scranton and Wilks-Barry, PA and is maintained by the Ziman Funeral Home in Scranton. 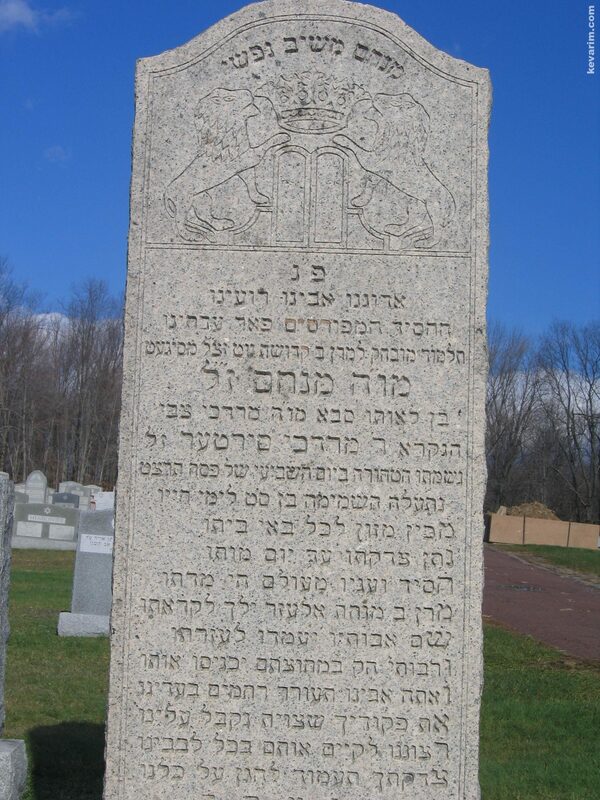 On the Matzive it says that he was a deciple of the Kedishas Yom Tov of Sighet (Rabbi Lipa Tietelbaum) and of the Minchas Eluzer on Munkatch (R Chaim Eluzer Shpiro). Based on conversations with old-time Scrantoners. I am an ?old time Scrantoner? I was heard from Rabbi Mordechai Dov Fine of Machzikei Hadas that the Rabbi Schwartz had a mikvah in his house. Miller where does it say that he was a disciple of the Minchas Eluzer. Sorry, my Hebrew is not the greatest, I think it says his father was known as R? Mordecai Ferter. What does Ferter mean? His father was Mordechai Zvi Schwartz of Sirte, hence “Sirter.” R’ Menachem was known to be the only person living in America whom the Minchas Elazar would accept money from. The M.E. would only take money from people known to be Shomer Shabbos. Mordechai Sirter’s father was Aharon Pataker and his father was Mordechain Zvi Schwartz of Tertzal, married to Zisel who became the wife of Yitzchak Eiizik Taub, the first Kaliver Rebbe, his second marriage. Miller: The town of Sirte is very close to Ungvar. It seems that you have decided not to post my previous comment. Perhaps you think I made it all up. In the reprint of “Devarim Areivim” by Dov Ber Ehrman, you will find a portion of the family tree. Regarding his descent from the second Kaliver Rebbitzen, you can find that in the “Toldos Kol Aryeh.” Aharon Pataker, R’ Menachem’s Zeida, was the Kol Aryeh’s uncle. Thanks for the noteworthy information. Whoops! I apologize. I am new to this site and I mistakenly thought that you were the moderator. He was a Frum, learned, Chassidishe businessman. I knew two of his sons who lived inChicago and I am in contact with a nephew living Silver Spring, MD. No one ever told me that he was an Admor and I do not think that he ever held a position in Europe. He was the leader of the Scranton comunity and, yes, he did have his own Mikva in his house. 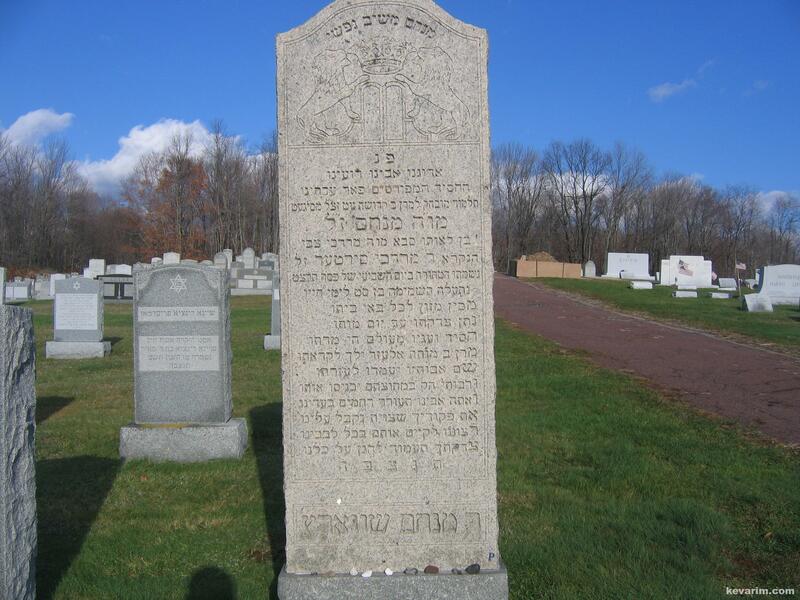 There was a Rabbi Mordchai Zvi Schwartz first in Londan and later in Cleveland OH, who was also a Sigheter Talmid, was he related to this Rabbi Menachem Schwartz? Cousins. Clevelander Rav was my Zeide. Where is your Ziede buried? I found the “Devarim Arievim” online, very interesting stories. I hope one day you will provide Baruch a picture of your Zeide’s Kever in Ohio. I am one of Menachem Schwartz’s grandchildren. I lived in Scranton my first 5 years and visited there until after my grandfather’s death. I was there the Pesach he became ill and died. Indeed there was a mikvah in the house. I did not know he was a Rebbe. There are 2 other living grandchildren. What was the names of his sons and do you have any stories or photos to share of your GFather? can you clarify the scenario of whom Zissel was married to? Was she first married to R’ Mordechai Tzvi of Terzel and then married to the first Kaliver Rebbe? Did she remarry after R’ Mordechai was niftar? Was the Kaliver Rebbe ‘s wife already niftar too? Ehrmandesc, yes to all your 3 questions. I think one of his grandchildren is a Magid Shiur at Rav Parler’s Yeshiva in BP. There was a story of someone who needed help and was sent to R’ Menachem by the Atzei Chaiyim the son Of the Kedushas Yom Tov. The Atzei Chaim was niftar in between. When R’ Menachem neglected the rebbe’s request, he saw the Atzei Chaim in his dream who asked him why he’s waiting. taken aback by this vision he assisted that person at once. I see you are familiar with the family. I searched alot and couldn’t find the name of R’ Menachem’s mother. Can one of you verify? His mother’s name was Malka. Her maiden name was Friedman. Thanks. Would you know the source for this. Also, going further, do you know more info on which friedman? Growing up in Scranton in the ’60s and ’70s I recall two houses that had been his (800 block of Madison Ave) being equipped with mikvaos but that he had moved back to the south side (Flats section) at the time of his petirah. Coincidentaly, I befriended his great grandson (from Chicago) when we were both campers in Camp Kol Ree Nah in the mid ’70s . IIRC his dad was an executive with a large retailer, Montgomery Ward if my memory serves me correctly. 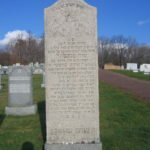 Did Reb Mordechai Tzvi of Sirte have any other children besides Reb Avrohom Leib of Ungvar and Reb Menachum of Scranton? Does anyone know around what years did Reb Mordechai Tzvi of Sirte live? If you are a descendant of Reb Menachum of Scranton please contact me. I stumbled onto this discussion, b’hashkocho. My father, was born in Scranton in 1923 and spent his first 19 years there (with the exception of a year at Torah V’daas in 1937–he went together with his best friend Artie (Abish) Mendlowitz, the nephew of the Rosh Yeshiva, ZT”L). Anyway, whereas my Zeide (who I was named for) lived his life according to the verse “Hatzneah leches im Ha-Shem”(walk humbly with G-d)–My dad tells me that he always wore a thin gartle under his shirt, my father remembers Reb Menachem Schwartz very well as a larger than life figure. And though people didn’t refer to him as a rebbe, per se, everything he did was with Yiras Shomayim. Someone in the kehilla was making a bar mitzva and needed tefillin? You went to Menachem Schwartz. He was also the address to get wine and schnapps during prohibition, as he and he alone had the government concessionary for “sacramental” beverages. I came to Scranton back in ’94 when I was bringing my then 11 year old to camp in the Catskills (we live in LA), and went to Dalton to daven by my Bobbe and Zeide, and was immediately drawn to Reb Menachem’s matzeva. I will IY”H share what you have posted about Reb Menachem with my father, and see if he can recall any other memories worth sharing. How can I help you? The Sefer on the Schwartz rabbinic family,”Siach Zekainim” was published several years ago by R’ Moshe Schwartz. His father, the Rav of Laniado Hospital in Kiryat Zanz , is probably the person you sent the letters to. I would love to obtain copies of my Zeide’s letters. Who are the letters written to? Uncle BlackLeibel,why haven’t I heard of Siach Zekainim? You know so much about our family, but what good is it if your tree and wealth of knowledge is either kept secret or exposed, barely, on kevarim.com? I would love to know more about your zeida and his family. Interesting. Who is the מחבר? It was a long while since I first heard from you the name of Reb Menachems mother. 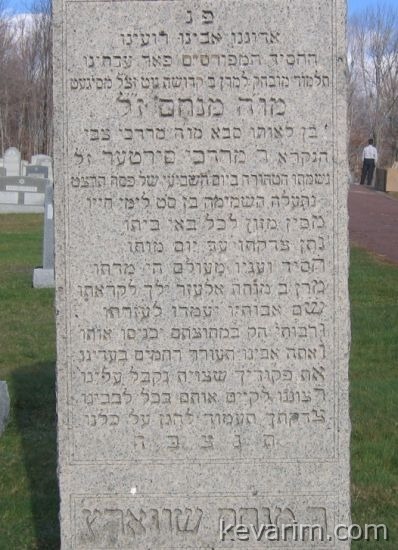 It is now nogeys to us very importantly for a matzeva (tombstone) of reb menachem’s brother. But I would really need to know a 100% source to this. please email to ouryichus@gmail.com I would really appreciate it. 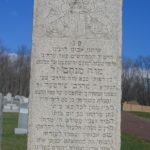 Can anyone provide information about our family and the Kaliver Rebbe connection? Re: Family tree of my father Miklos Schwartz (Binjumin Yonason Binjumin ben Josef) z’l. My father was born Porcsalma (village in Szabolcs-Szatmár-Bereg county, in eastern Hungary. My father’s great uncle is Ignacz (Yitchak Issac Dov ben Yonason). 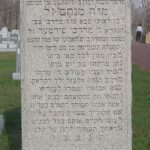 The only “Schwartz” ancestral connection to the Kaliver Rebbe that I am aware of is his second marriage to the widow of Mordechai Zvi Schwartz of Tertzal. No children were born of that marriage. How can i locate the 2 seforim mentioned above- אור גדול and Siach Zekainim?